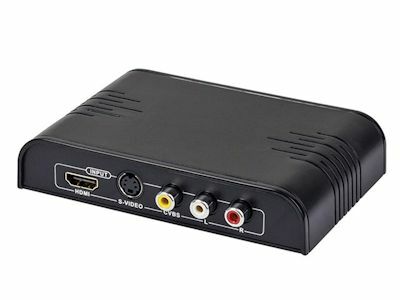 The primary purpose of this converter is to take legacy Composite or S-Video input and convert it to HDMI for use on your newer HDTV. 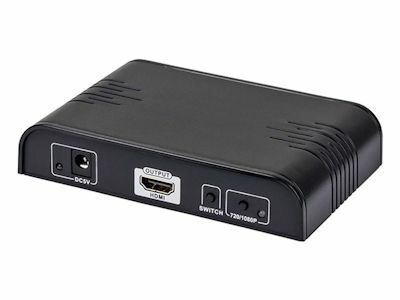 The converter accepts a low-resolution 480i legacy input and up-scales it to a high-resolution 720p or 1080p HDMI digital signal. The HDMI input allows the converter to perform up-scaling on low-resolution HDMI signals, so you can view them at the full 720p/1080p resolution supported by your TV. The output can be switched from 720p to 1080p at the press of a button. Another small button on unit switches between the composite/s-video input and the HDMI input.